If you're on the lookout for a casual yet totally chic ensemble, choose an Erika Cavallini longline blazer and blue skinny jeans. Both items are totally comfy and will look fabulous paired together. You could perhaps get a little creative when it comes to footwear and lift up your outfit with tan leather heeled sandals. 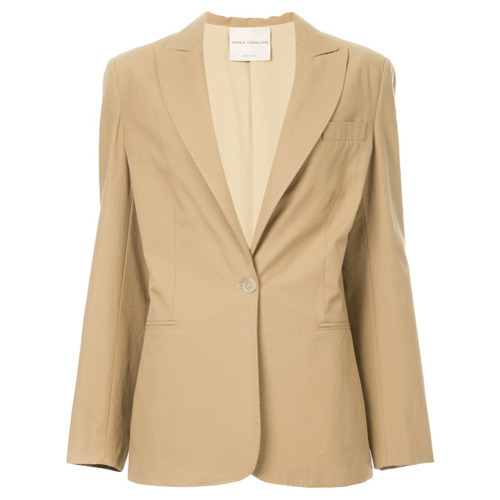 If you're looking for a casual yet totally chic look, pair a tan blazer with white tapered pants. Both items are totally comfy and will look fabulous together. When it comes to shoes, this getup is round off wonderfully with white leather wedge pumps. This pairing of an Erika Cavallini tan blazer and blue flare jeans exudes comfort and functionality and allows you to keep it simple yet contemporary. You could perhaps get a little creative when it comes to footwear and spruce up your getup with black leather ankle boots. If you're all about comfort dressing when it comes to fashion, you'll love this uber cute pairing of an Erika Cavallini longline blazer and dark green leggings. Opt for a pair of tan leather pumps to va-va-voom your outfit. This combination of an Erika Cavallini longline blazer and navy plaid skinny pants is very easy to achieve and so comfortable to sport all day long as well! Spruce up your look with black leather pumps. 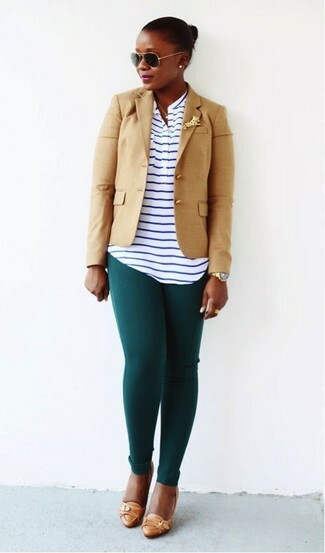 An Erika Cavallini tan blazer looks so nice when combined with navy and green plaid skinny pants. Complement your outfit with black suede ballerina shoes to give a dose of playfulness to your look. 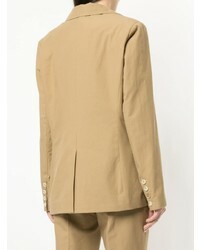 A tan blazer and khaki dress pants worn together are a total eye candy for those dressers who prefer cool chic styles. On the shoe front, this look pairs perfectly with white leather pumps. This casual combination of an Erika Cavallini tan blazer and a beige jumpsuit is very easy to put together in next to no time, helping you look chic and ready for anything without spending too much time rummaging through your wardrobe. With shoes, go down a classier route with black leather heeled sandals. A tan blazer and charcoal leggings are the kind of a no-brainer casual ensemble that you need when you have zero time. If you're clueless about how to finish off, a pair of white low top sneakers is a tested option.